by Tom Bruulsema, Robert Mullen, Ivan O'Halloran, and Harold Watters. 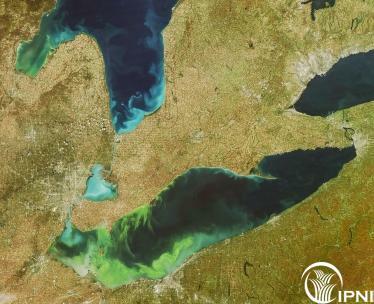 Algal blooms in Lake Erie have been getting worse in the past few years. Phosphorus (P) has often been considered the nutrient controlling such blooms. The loads of dissolved P in the rivers draining into Lake Erie vary greatly year-to-year, but higher loads have become more frequent in recent years than in the mid-1990s. Agriculture is one of several sources of dissolved P. This article outlines how crop producers in the Lake Erie watershed can reduce losses of P by adopting a 4R Nutrient Stewardship approach to guide their fertilizer application practices. See the IPNI Insights article, listed under "Related Content."